As end-times prophecy is rapidly being fulfilled, many Christians are clinging to “the blessed hope,” the rapture of the Church. For God has promised, “we are not destined for wrath, but to salvation through our Lord, Jesus Christ.” (1 Thess. 5:9). For this reason, many are teaching that the rapture of the Church will occur before any of God's end-times judgments (described in Revelation as the seven seals, the seven trumpets, and the seven bowls) occur. In this discussion, there is one important factor that most people overlook. There is difference between judgment and wrath. According to Webster's Ninth Collegiate Dictionary, judgment in this context is defined as “a divine sentence or decision; a calamity held to be sent by God.” Wrath, on the other hand, is defined as “strong, vengeful anger or indignation; retributory punishment for an offense or a crime.” Big difference. In determining the timing of the rapture, it is important, then, to determine the start of God's wrath. Could the seals, the trumpets, or the bowls also be God's wrath? Certainly. The question is: Are they? There are 13 uses of the word “wrath” in Revelation, each using the Greek words orge or thumos. From the beginning of Revelation until the opening of the sixth seal, the word “wrath” is absent. It is not used in the first seal, the rise of the Antichrist; the second seal, the Antichrist's waging of world war; the third seal, the worldwide famine; the fourth seal, widespread death on the earth; or even the fifth seal, the cry of the martyrs. The first time the word “wrath” is used is in Rev. 6:17, after the opening of the sixth seal: “And the [mighty men of the earth] hid themselves in the caves and in the rocks of the mountains and said to the mountains and rocks, 'Fall on us and hide us from the face of Him who sits on the throne and from the wrath of the Lamb! For the great day of His wrath has come'” (Rev. 6:14–17). In the Greek, the language in which the book of Revelation was written, this phrase “has come” can have two meanings. It can mean an event that has already transpired (and therefore is an event that the speaker is presently experiencing), or it can refer to an event that is imminent but has not yet arrived. If, in this case, it means that God's wrath has arrived, this lends support to the contention that the seal judgments, which are the first judgments poured out by God, are His wrath. 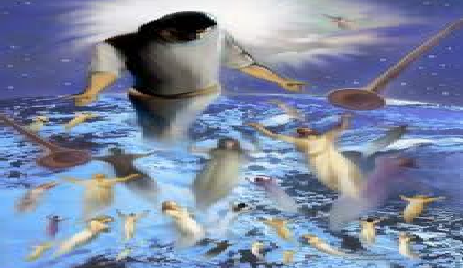 Therefore, the rapture must occur before the seal judgments begin. If, on the other hand, the phrase “God's wrath has come” means that His wrath is imminent but not yet arrived, the rapture does not have to occur until after the seal judgments are complete. Is there some way to determine which definition is correct? God's Word does not leave room for doubt. Because we know that God's wrath is contained within the Day of the Lord, if we can determine when the Day of the Lord begins, we can identify the earliest starting point for God's wrath, as well. Joel fills in this final, important detail: “The sun shall be turned into darkness, and the moon into blood, before the great and terrible Day of the Lord” (Joel 2:31). When does the sun turn dark and the moon into blood? The Bible couldn't make it more clear. This occurs as part of the sixth seal: “I looked when He opened the sixth seal, and behold, there was a great earthquake; and the sun became black as sackcloth of hair, and the moon became like blood. And the stars of heaven fell to the earth, as a fig tree drops its late figs when it is shaken by a mighty wind” (Rev. 6:12-13). The Day of the Lord — and therefore God's wrath — begins with the opening of the sixth seal. The implications for believers are profound. Many are teaching that the rapture must be pretribulational because God's wrath starts with the opening of the seal judgments. If this is not the case, then the rapture does not have to occur until after the seals have begun (which is, in fact, what the Bible teaches). This means that the Church will enter the time of the greatest natural and spiritual disasters in history. Believers will have to face the Antichrist. They will have to make a decision between possible martyrdom and the taking of the mark. Therefore, their level of spiritual preparation must be profound, as well. Are you ready? It's one thing to say that you are ready. But what happens when you start losing the security of your food, your clothing, and your shelter? What happens when the earthquakes are tearing your neighborhood asunder and just practicing your faith can, and will, get you killed? Spiritual preparation suddenly takes on new meaning.